With a wide understanding of the relevant market, we are providing a wide collection of Quick Release Couplings. This coupling is manufactured by using optimum quality stainless steel & carbon steel with the employment of cutting-edge technologies. The offered coupling is mainly use in chemical, automobile industries and refineries as these are able to withstand high pressure. 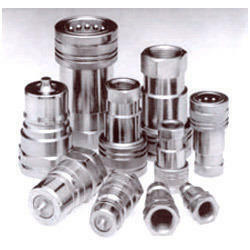 Offered coupling is checked in terms of quality so as to dispatch a fault free range from our side. We have been successfully supplying hydraulic pumps, valves and accessories for the last 10 years. In all these ten years, our main focus was on quality and we still continue with the same approach. With our extensive client database, we can candidly admit that we have been able to deliver consistent quality year after year. Our inventory of products includes hydraulic pumps, hydraulic hoses, proportional controls, cartridge valves and blocks, hydraulic control valves, customized power packs. Along with these highly acclaimed products, we are also supplying cylinders and manifold blocks, accumulators, filters and tank accessories, oil coolers, mobile controls, hydraulic motors, qrcs and fittings. Keeping our commitment of 'delivering quality' to our customers, we are engaged in the distribution of machines and components manufactured by distinguished companies such as DOWTY, ATOS, WALVOIL, MPFILTRI, SUN HYDRAULICS, POLYHYDRON, SPICA HYDRAULICS, GATES. Our association with these reputed names gives support to our claim of delivering consistent quality.